labor (1) labi lapsus dep. [to glide , slide, flow; to slip, fall down, fall away, decline; to make a mistake]. "The bathers themselves were unable to explain what it was that propelled them with such astonishing velocity along the foot of the wave, and I have conversed with a lawyer of distinction now practicing in this country, who was born and brought up at Hilo, and was himself a successful surf bather. manifest, but 'how' he would not venture an opinion." John Dean Caton: Surf-riding at Hilo (1880), pages 244-245. While it is not necessary to scientifically understand the dynamics of surfriding to successfully perform the activity, a basic appraisal of the process may mariginally increase the surfrider's appreciation of the art. It is important to initially distinguish the difference between riding on the face of a breaking wave and riding the resultant foam or the white-water wave (a wave of translation). Such an analysis must examine the mechanics of the breaking wave. Secondly, to eliminate secondary propulsion forces, this account is based on the dynamics of a standard surfboard, approximately 8ft x 22'', ridden in a standing position. Body, bellyboard, kneeboard and sufski surfriders often kick and/or paddle to increase propulsion when there is a decrease in wave power and this can significantly complicate the analysis. Given the extreme, possibly inexplicable, manoeuvres demonstrated by modern surfriders, the analysis should similarly be limited to a range of, relatively, low-skill standard or basic functions; the take-off, trimming, stalling and turning. Finally, the analysis must not only describe the motion of the surfrider down the wave face and directly towards the beach, but the more complex traversing process whereby the ride is at an angle to the wave face. As such the rider travels faster than the wave speed, as expressed by Caton- the "astonishing velocity along the foot of the wave". 1.the mechanics of the breaking wave. This appears to be the case for ancient Hawaiian surfriders as reported by John Dean Caton:. Caton: Surf-riding at Hilo (1880), pages 244-245. Note however, there may be communication or translation difficulties in this report. "Caton found the natives could not explain why they were propelled shoreward with such astonishing speed, nor could Mr. Caton explain it himself, nor could my friends. 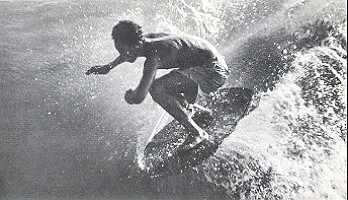 Blake: Hawaiian Surfriders 1935 (1983), page 42.
swell is very irregular and much deformed. That there is a rapid current rushing along at the foot of the wave at right angles to its general course I cannot believe. maintain its position in front of the wave. direction not in accord with the impelling force, as by trimming the sails of a ship, so that the wind will strike them obliquely the vessel is propelled in a direction different from the course of the wind. are not sure that we are acquainted with the force and direction of all the currents which accompany a wave of the sea. give a more satisfactory explanation of the striking facts which I have detailed. hands of the Australian native." Attempts to analyse surfboard dynamics in the early 20th century have not always greatly advanced our understanding. This is accomplished by paddling the board with the hands and arms. (8) - Blake(1935) page 43. 7. "the friction of the slippery board against the water is very small"
My physics is a bit rusty, but I think that the friction on the board is significant - otherwise the board would sink. 8. "to catch up with the incoming swell ... by paddling the board with the hands and arms." One of the most common misunderstandings by surfriders - technically the wave "catches" the rider. 1.1 The wave speed decreases. 1.2 The angle of the wave face increases. 2. The minimum planing speed of a surfboard is a function of its planning area (volume? displacement?) and the rider's mass, less drag. 3. A surfboard and rider are propelled by a wave when the minimum planning speed equals the wave speed. 4. A surfboard planes on a wave face when its gravitational potential energy is released as the angle of the wave face increases. 5. A given surfboard will plane independently at a given angle of the wave face. The lower the minimum planning speed of a board, the required wave face angle is smaller. 6. The Take - Off - "Catching the Wave"
The surfer does not catch the wave, if anything the wave catches the surfer. A surfer can not paddle any craft at wave speed. The surfer paddles the board to a position where the angle of the wave face is steep enough for the board to achieve minimum planing speed. 7.1. "hydrostatic naval architecture is not applicable to the planning hull...The fundamental hydraulic laws upon which standard naval architecture proceedures are based simply do not apply to a hull skimmimg the surface." 7.2. "the submerged body, moving with sufficient rapidity, increases turbulence and the resulting suction drag, soon reaching a speed at which the viscosity of the liquid prevents further increase in speed regardless of practical increases in power. With the plate (surfboard) moving in its own plane, this type of suction drag due to the viscosity of the liquid is not a factor in the performance. Rather, the resistance, aside from skin friction, is largely due to the simple transfer of kinetic energy at the leading edge. Thus it becomes apparent that the leading edge of the plane at once accounts for a major portion of both drag and lift. But since lift rises as the square of the speed, and drag increases at less than the square of the speed, every proportionate increase in leading edge increment becomes successively more and more worthwhile. In other words, while increasing speeds require the displacement hull to become progressively narrower, the planning hull moving at high speed requires the widest possible beam. To simplify still further, the displacement hull can improve its speed only with added length; the planning hull requires added beam." 7.3. ''With planning hulls, then, there is no theoretically sound procedure by which the total resistances of one hull can be directly compared to the total resistances of another hull radically different in size." Page 25, follows analysis of Froude's Law of Comparison and the Reynolds number. 7.4 ''Unfortunately, airfoil or hydrofoil data is of limited value as an approach to this problem (of bottom loading). The boat's (surfboard's) bottom operating at the boundary between two mediums, one of which is approximately 800 times as dense as the other, allows but for one working face of the plane. Furthermore, while this one face should ideally be subjected only to positive pressures, certain configurations of the average bottom lead to varying degrees of transient negative pressures which may detract from the net dynamic lift of the plane." Note that this does not apply to fins, which are true hydrofoils. to "improve its speed ...; the planning hull requires added beam." Important Note - this does not apply to "cutting", which is a unique phenomenon. The angle along the wave face is a function of the rate of peel. It is independent of wave height and wave speed. 10. When the board cuts or angles across the wave face, natural wave dynamics cause the leading edge of the board to extend longitudinally, thereby greatly increasing the board's speed. Board speed is a function of the planning area (volume? displacement?) and the rider's mass, less drag. The smaller the board, the greater maximum planning speed. The larger the board, the lower the minimum planning speed. This has been demonstrated by Tow-In boards - a large board is needed to take off on a large wave, but once planning a small board is faster. The problem for surfboard designers has not been to make the boards go faster (the solution is to make them smaller), but to maintain control at speed. The major developments in this area have been light weight, the soft down rail, the breakaway edge and sophisticated bottom rocker. Simon Anderson's Thruster - Three fin design provided stability and control in extreme conditions , unimagined by earlier designers. Consider the following boards with similar beam and planshape. Increase in length increases the planning area. For a given wave and a given rider, each board will have a different minimum planing speed. Board A achieves minimum planing speed at wave face angle f a. Board B achieves minimum planing speed at wave face angle f b. Board C achieves minimum planing speed at wave face angle f g.
Now assume a bottom formation of several sections at decreasing depth levels such that a given wave maintains a given wave face angle over a reasonable distance. At each change in depth (1, 2 etc), the wave face angle becomes steeper. Such wave conditions are rare, but not unknown, for example Waikiki, Ohau. The Hawaiian language has a word "ohu", defined as "a low wave that rises without breaking but is of sufficient strength to be ridden with a surfboard. " Finney and Houston, page 95. Board A will plane when the wave reaches Position 1, and will travel at wave speed to Position 2. Board B will plane when the wave reaches Position 2, and will travel at wave speed to Position 3. Board C will plane when the wave reaches Position 3, and will travel at wave speed to Position 4. At Point 2, Board A's potential speed is increasing and the wave speed is decreasing. Similarly for Board B at Point 3, or Board C at Point 4.
i. The board accelerates down the face towards the trough. This will ultimately result in rapid deceleration as the wave face angle approaches 0.
ii. The rider stalls the board (applies drag) and maintains board speed at wave speed. iii. The board travels at an angle to the wave face, the resultant vector being at wave speed. 1. A long walled hollow point break. 2. 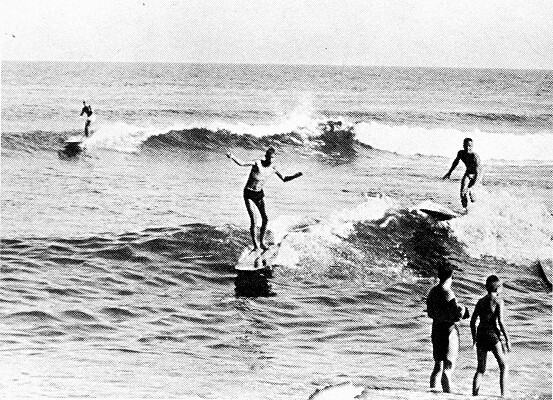 Three riders on similar boards take off on a wave at a fixed point (T/O). 3. No board's wake effects the other riders. 4. Rider #1 takes off (T/O) behind the peak and turns into the tube at a second fixed point (T1). With minor adjustments the surfer stays inside the tube in a straight line till a third fixed point (T2). 5. Rider #2 takes off (T/O) on the shoulder and sets up a bottom turn at the second fixed point (T1). With major adjustments the surfer climbs and drops on the wave face till a third fixed point (T2). 6. Rider #3 takes off (T/O) on the wall and walks to the board's nose at the second fixed point (T1). With minor adjustments the surfer noserides in a straight line on the till a third fixed point (T2). 1. Rider #2 rode the longest distance. 2. Riders 1# and #3 rode a shorter and equal distance. Rider #2 has the highest velocity (v = d/t). Riders #2 and #3 have the same velocity !!! - the Analytical Dilemma. Tube riding surfers report that inside the tube "time slows down". 1. Extreme board speed, see above. 2. Visual "tunneling" as predicted by Al Einstein when approaching the speed of light. Although surfboard design is not studied in this book, they are planing hulls and severval principles expounded by Lindsay Lord appear applicable. The book was treasured by seminal Californian board builder, Bob Simmons. Many of the models and diagrams appear similar to Simmons' famous wide tailed Spoons of the early 1950's, Lord emphasizing the increase in lift by incorprating parallel running lines, page 71. 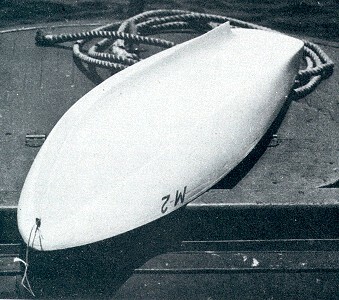 Figure 29, page 72 illustrates one of Lord's models (M2) that features nose scoop, concave bottom and twin keels (fins). See image below. The chapter on rudders, illustrates a thick foil that resembles some examples of Bob Simmons' fins, page 221. 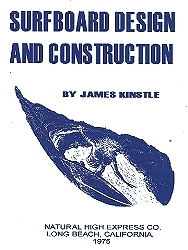 The chapter on Hull Structure promotes the use of resin laminates, particually plywood, as an emerging and superior constuction technique. 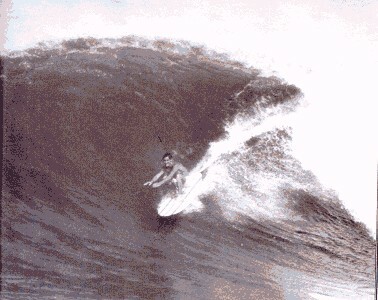 - see Legendary Surfers : Bob Simmons Vol 1 Chapter 15 1946. Soft cover, 139 pages, extensive black and white illustrations and diagrams. This is not an original, but a photocopied version contributed by A. 1. Probably the most technically detailed work on surfboard design ever published, many sections are unique. It would be unfair to attempt a critical review at this point since I don't feel that I fully understand much of the work, in particular Chapter 2 Surfboard Dynamics. Further analysis of the book appears to indicate that much of the work on surfboard dynamics is in error. Almost all the diagrams indicate a considerable portion of the board immersed in the wave. This is generally not the case - as hydronamic planning hulls, surfbards plane on top of the water surface. This is illustrated in many photographs, see Bob Simmons in trim below. Kit Horn, Bob Simmons and Buzzy Trent. Solid Laminates, Malibu, circa 1941 - 1944. Photo by Michael Peterson, 1973. No quite a barn door, but close. I was unaware of your family connections with the Shoalhaven - a strange congruence. 1. It adds no new information to the story. 2. Is without specific references. 3. The book itself appears to be general in nature and in some places is less than accurate. I cross checked with the entry for the 1964 World Surfing Championships at Manly NSW (about page 106) and noted several discrepancies. Champion, Shelagh and George: Bathing, Drowning and Life Saving in Manly, Warringah and Pittwater to 1915. Published and printed by Book House, Glebe, 2000. I have requested a copy by inter-library loan, but these can take up to four weeks before the item is available. Please note that even basic physics is testing my intellectual capabilities and any comments are offered with less than 100% confidence. Firstly, I feel we may be approaching the question from somewhat different perspectives. You appear to largely base your analysis on body surfing and surf life saving race and/or rescue events. My view is focused more on surfboard riding. My focus is not just a personal preference - I would suggest that while all surfriders essentially replicate similar dynamics, the standing surfrider's motion is essentially dependent on the motion and structure of the wave. Body surfers (in addition to the ability of skilled practitioners to make substantial variations in their body shape and in their buoyancy) often kick and/or paddle while riding on the wave to supplement the wave propulsion when there is a decrease in wave power to maintain or improve their position on the wave. Similarly for bellyboard, kneeboard and sufski riders. This is most evident in the surfriding performance of sail and kite boarders. These supplementary applications of force could significantly complicate the analysis. Furthermore, for surf life savers when attempting a rescue or racing in competition the preferred course is (usually) a direct line to the buoy/patient and back to the beach. Waves are then ridden the shortest distance straight to the beach. For the surfboardrider the object is to ride transversely across the wave face, thereby maximising the length of the ride. In your example of "using a boogieboard, surf-o-plane or other craft" which "proceed some distance ahead of the broken surf front. But then it catches up with one and it is then difficult sometimes to stay in control", the experienced surfrider avoids this situation by directing the board transversely (either left or right) and continues to ride on the much more controllable green breaking wave face. It is likely the dynamics of this transverse motion are somewhat more complex that proceeding directly to the beach. "one can catch and ride a broken wave on a sandbank"
The "breaking wave" and the "broken wave" are two different hydrodynamic entities. In the former, the water transcribes increasing elliptical obits as it approaches shallow water and breaks when the obit is broken by friction with the bottom. 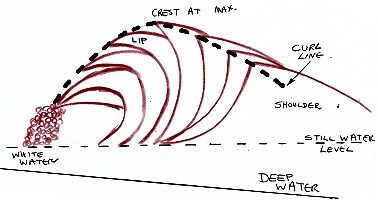 The movement of water in a breaking wave is highly complex (illustration below) but until the crest approaches its maximum height, the resultant motion of the water towards the beach maybe relatively minor. "when waves are steep the orbital circles of the water particles do not exactly close. The water itself is transported by the passing wave form, although its progress is very slow compared to the wave velocity." Garden City, New York 1964. , pages 38 and 39 and image below, page 40. "FIG. 14. Movement of water particles as a wave breaks in wave channel (from motion picture analysis)." seaward (from the trough) and up vertically up the wave face. As large surfcraft (boards and skis) can catch and ride the wave well before the wave crests ("runners") it would appear that this motion may not be dependent on "the forward drag force exerted by the water particles." Certainly once the wave has passed the point of maximum crest height, and the crest now becomes "the lip", there is a massive forward movement of power and water. This results in the broken wave, the white-water or "a wave of translation" [Bascom (1964), pages 160 and 161]. Now a wall of aerated water, without the discernable wave face or the characteristic trough of the breaking wave, it moves enmass towards the beach. In most cases, a riderless bouyant object located anywhere inside the breaking wave zone will be easily caught by the white-water and carried swiftly shoreward. This basic motion is commonly and effectively used by riders of highly buoyant inflatable surfo-planes or surfmats. For green breaking waves the situation is almost the reverse - a riderless bouyant object moving towards the beach from deep water (say propelled by a very light onshore wind) will simply rise and fall with the passing of the swells and only is lauched rapidly shoreward when positioned at a critical point of on the face of a breaking wave. The dynamics of a breaking wave as it approaches shore. [after Bascom (1964), page 160]. Surfboards, small craft, and animals (including porpoises and body-surfers) can take energy out of the waves to propel themselves by sliding down the forward surface of an advancing wave. 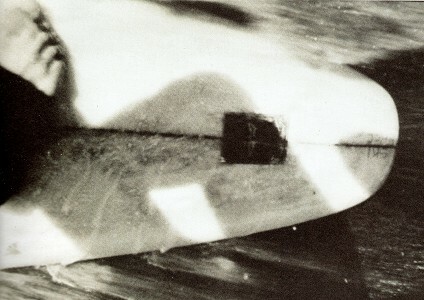 The surfboard is thrust forward by a downhill force or slope drag, shown in Figure 46 as a vector connecting the gravity force to the buoyancy force (which always acts perpendicular to the water surface). The trick of surfing, of course, is to get the board moving and the weight properly balanced so that the slope drag can take over the work of propulsion at the moment the wave passes beneath. If the surf- board is also moving sidewise across the face of the wave, it may move at a considerably higher velocity than the wave itself. Dukws- amphibious trucks used for surveying the surf zone-not only can assume the proper slope, but also can also take advantage of an additional effect to "surfboard" on large breaking waves. ... the orbiting water particles to press against. Body-surfers who hold their hands down beneath their bodies can get the same kind of boost. The air-water interface is a surface of constant pressure; beneath it are other parallel surfaces of constant pressure that move with imaginary waves that are subsurface reflections of the visible waves above. Porpoises are neutrally buoyant and with a little practice learn to tilt themselves at the proper slope to take advantage of the slope drag to surfboard on some underwater constant-pressure surface. These animals can ride beneath the bow wave of a ship indefinitely without appearing to exert any effort at all. Apparently a porpoise can do this because the skin drag of his curious hide is less than the slope drag on the invisible surface. It is possible to surfboard on the waves made by a ship. As boys on the Hudson River we used to paddle frantically to get a canoe into the proper position behind a ferryboat as it pulled away from the pier so we could get a free ride across the river, merely steering to hold position on the steep slope of the first transverse wave in its wake. And it is also possible for boats to surfboard on their own waves. In the days when canal barges, drawn by horses on a towpath, were widely used for transportation, the horses soon discovered that if they temporarily speeded up on approaching a narrow stretch of canal, they could then relax while the boat rode the waves of its own creation. So reported Benjamin Franklin in 1768 after traveling on the canals of France. Many years later Scott Russell studied "fly boats" on the Scottish canals where the same "advantageous principle was employed to reach high speeds in the passenger trade." The canals were very shallow (probably less than four feet) so that the waves moved at (the square root of) gd velocity or about ten feet a second (7 mph). One can imagine that when the canal suddenly narrowed and the height of the bow wave increased, a wise horse (or driver) would smile to himself at the prospect of surfboarding his load for a while. Bascom (1964), pages 126 to 128. Assuming Bascom's Slope Theory is valid, then it may be invite further conclusions, comments and/or speculation. 1. Slope Theory decribes surfriding dynamics on the face of a breaking wave and not on the broken wave of translation. 2. It appears to be applicable to all surfriding methods - from the unencumbered body surfer to a 30 foot outrigger canoe. Furthermore, it is also applicable to wave riding of porpoises and, by implication, seals. When riding a wave, experienced seals can alternate between underwater constant pressure forces (like a porpoise) and the breaking wave face (like a human bodysurfer). 3. Slope Theory essentially describes the the point where the surfrider achieves take-off, that is moving at wave speed and dependent only on the forces of the wave. 4. The determining factor in successful surfriding is a direct relationship between bouyancy and the slope of the breaking wave face. Therefore, larger (more buoyant) craft achieve take-off at a (relatively) slight wave face angle. This is often at a considerable distance before the wave breaks. Conversely, smaller craft require a steeper wave face angle to achieve take-off. This is usually very close to where the wave breaks. This variation is often simply observed at popular beaches. If viewed from the side, for example at a central position on a headland, the surfriders appear in striated bands based on craft size. From shore the surfriders are grouped as inflatables, bodysurfers, handboards, bellyboards, kneeboards, small surfboards (6ft), standard surfboards (8ft), large surfboards (10ft), surfskis and furtherest out to sea, surfboats. 5. Surfriding is dependent on wave shape and not, although it is certainly enhanced, by wave size, wave speed or wave power. 6. Slope Theory does not require that the rider "paddles onto the wave", the essential factor is to postion the surfrider at the critical take-off point. This importance of critical postioning is illustrated by the "no paddle take-off"
"You can then do some expert shooting. being lifted, swing the body round and forward. If you have timed this movement correctly, the wave will do the rest." Hay, Harry: Swimming and Surfing. Jantzen (Australia) Ltd, Lidcome, Sydney, 1931, page 12. As a surfrider paddles (or swims) significantly slower than the wave speed, in a sense they do not catch the wave - rather the wave catches the surfrider. 7. While it may appear minor in the context of Bascom's large picture analysis, he does not note the importance of wind conditions to the surfrider. In onshore winds the board speed will be slightly diminished due to the surface chop and the wave will break earlier than if dependent of the bottom contours. Once broken, it's rate of peel, or the curl speed, will be erratic (see 8 below). In no-wind conditions the board will travel smoothly, and the breaking of the wave will depend on the bottom contours. In mild offshore winds surface chop will be largely negated by the action of the breaking waves in the opposite direction and surface conditions on the wave face may resemble no-wind conditions. This wind will tend to hold up the wave face and delaying breaking. "If the surf- board is also moving sidewise across the face of the wave, it may move at a considerably higher velocity than the wave itself." He does not give a detailed account of the dynamics of the wave face as it breaks transversely, a characteristic highly valued by surfriders. For surfriders, the longest and clearly defined transversely breaking waves are at point breaks where the swells align at approximately 90 degrees to the shoreline along the point. Famous Australian examples include Byron Bay in NSW and Rainbow Bay, Queensland. In the case of the point break, a three dimension image of the bottom contours, and the resulting breaking wave pattern, can be conceived as a conjunction of the illustration above showing the progressive wave structure towards the (actual) shoreline and the same image, now static, rotated 90 degrees where the unbroken wave in deep water is now seen as the wave "shoulder". Front View of Static Left Hand Transverse Breaking Wave (very poorly drawn). In this view, the surfrider slides towards the right of the image (to his left) and away from the whitewater. The wave shape is indicated by the the curl line connecting the crest at the various stages of breaking. For the surfrider when riding transversely, the speed with which the wave breaks along the curl line (the rate of peel or curl speed) can be critical. In nature, this perspective most resembles a concave spiral vortex, uniquely in the case of the breaking wave, in a horizontal plane. Vortexes were of particular interest to Leonardo da Vinci. "The peculiar form and efficacy of circulatory force in a vortex came from what he (da Vinci) called 'a circumstance worthy of note'; 'The spiral or rotary movement of every liquid is so much the swifter as it is nearer the centre of its revolution', unlike a wheel in which the movement 'is so much slower as it nears the centre' (C.A.296vb)." TAJ Books, 27 Ferndown Gardens, Cobham, Surrey, KT11 2BH, UK, 2004, page 307. The concave spiral characteristics of the transverse breaking wave may significantly contribute to transverse motion of surfriders across the wave face. movements which result from the penetration of one element into another' (F.34v)." dynamics, may also be further examined in the context of surfboard motion. successful take-off as described by Bascom's Slope Theory. Some insight maybe gained in the work of naval architect, Linsay Lord. 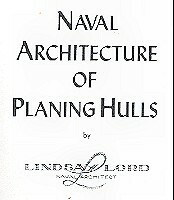 Lord, Linsay: Naval Architecture of Planing Hulls. Cornell Maritime Press, 241West 23rd Street New York 11, N.Y.1946. skimming the surface." - Preface, page vii. "Unfortunately, airfoil or hydrofoil data is of limited value as an approach to this problem (of bottom loading). The (planning hull) boat's bottom operating at the boundary between two mediums, one of which is approximately 800 times as dense as the other, allows but for one working face of the plane." - page 31. I would contend that a surfboard is a planning hull, as described by Lindsay Lord. Incidentally, the only part of a (modern) surfboard that performs hydrodynamically is the fin. "since lift rises as the square of the speed, and drag increases at less than the square of the speed, every proportionate increase in leading edge increment becomes successively more and more worthwhile. To simplify still further, the displacement hull can improve its speed only with added length; the planning hull requires added beam." - pages 12 and 13. To speculate, the transverse motion of a surfboard across the wave face is a function of the breaking waves conical or spiral structure (see 8 above). At take-off the board is traveling at wave speed, the leading edge basically the approximate width of the board. board to extend longitudinally, thereby greatly increasing the board's speed. This is illustrated in photographs of surfboard riders at high speed trim on large waves in the marked difference between the point of breakaway of the wakes from the inside rail (closest to the wave face) and the outside rail. Jeff Hakman: High Speed Trim, Sunset Beach, Ohau, 1965. 1. The marked difference between the point of breakaway of the wakes from the inside rail (closest to the wave face) and the outside rail. 2. The influence of offshore wind. 3. The wave shape as a right hand hydrodynamic horizontal concave spiral vortex.